“Today’s announcement is a tacit admission that taxes, levies and mark-ups on Spirits in Ontario are excessive and constitute a significant barrier to entry”, said Jan Westcott President and CEO of Spirits Canada. 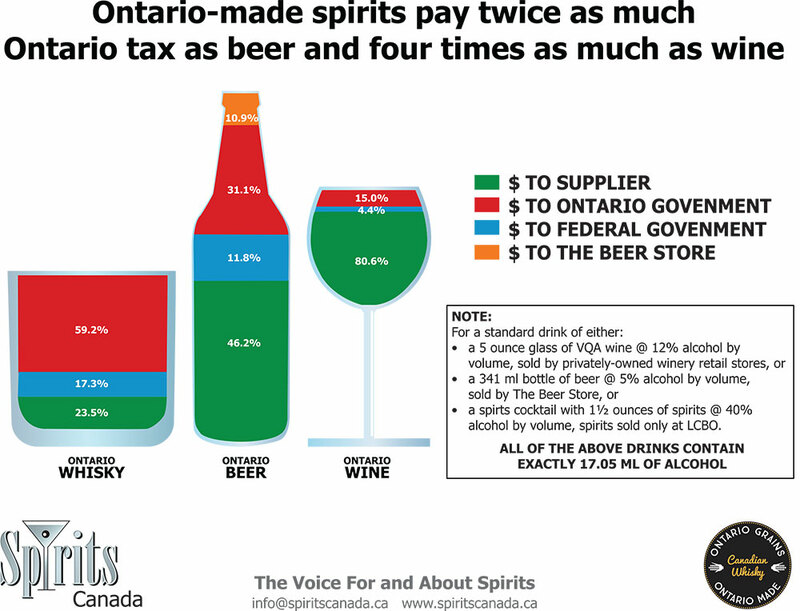 “Ontario’s tax load on distillers is twice that imposed on beer and four times greater than that imposed on wine”, added Mr. Westcott. Spirits Canada calls on Ontario to ensure any financial assistance is made available to all distillers who mash, ferment, distill and mature their full product line, whether their facility is located in Ontario, another Canadian province or anywhere in the world. “Ontario is a trading province, entirely reliant on open and fair access to foreign market and Spirits are the most highly-valued processed agri-food exports and we must ensure we abide by all the terms of Canada’s agreement on internal trade, as well as our WTO and FTA obligations and that means providing the same policy treatment and market access for all producers”, said Westcott. Returns available to distillers on sales in Canada are amongst the very the lowest in the world and imposed a very significant challenge to fund necessary industry investment in innovation, facility improvement, promotion, and market development. Moreover, at less than a single authorized outlet per 10,000 adults, Ontario provides fewer retail point of sale for Spirits than any province in Canada.